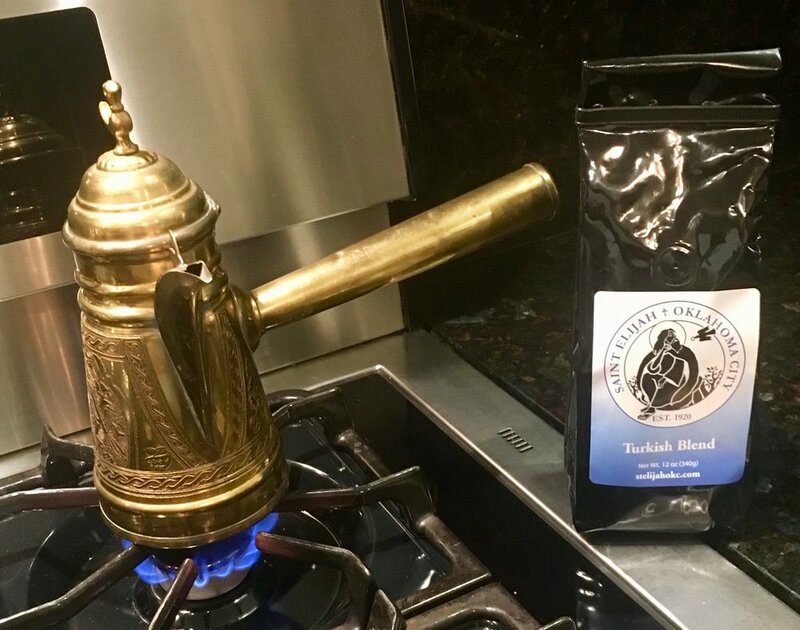 A portion of the proceeds from the sale of St. Elijah Coffee Blends goes to St. Elijah Orthodox Christian Church in Oklahoma City. First thing, the "Coffee Pot" is very different. It's known by various names like, ibrik, cezve or briki, but by any other name it is just a "Turkish coffee pot." Add about 2 1/2 teaspoons sugar (or to taste) *may add Cardamom spice at this point as well. Then mix. Bring to a boil, remove from heat and add a teaspoon of coffee per cup, but do not stir at this point. Boil coffee, letting it foam up to top, but careful not to let it boil over. Remove the pot from the heat and gently swirl around. Use a demitasse spoon and scoop a bit of the foam off the top and drop a bit into each cup. Bring to a boil once or twice more, taking care to remove the Briki from the heat between one boiling and the next. But beware, it will foam up faster each time. Take from the heat and let the coffee pot stand for about a half a minute so it can settle. Pour into demitasse cups and enjoy!